I had hoped to get way more done today than I did but I spent an hour looking for a stamp set that has gone AWOL! Seriously, it's missing and I have no idea where it might be. I finally gave up and decided on a different project for my club ladies when we meet on the 21st. I hope you enjoy this card. Hopefully, I'll have something new to post tomorrow. If not, check back Thursday for sure. Love all the techniques you combined on this card. So fun! Your cards are so cute! I love all the great 'little touches' that really make them Wow cards! WOW! This is like a technique laden card! 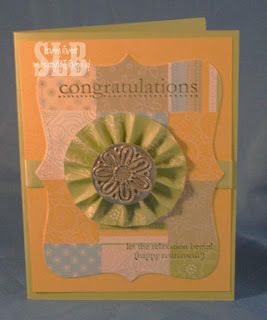 !I tried the faux metal and the only piece that turned out nice was the little flower like you have on this card. I think I am too slow to press my stamp in the heated EP and I don't get a good impression on the entire stamp-oh well I can admire yours!! I so have to do the faux metal now. This is so pretty. Love it!! This is really cute! Love that medallion!